We hear much about globalisation today, but in many ways the term is enigmatic. After all who can deny the value of a world being more connected and mutually cognisant of its vast, diverse, and planetary nature. However I offer another definition, and it's that as a society we have reached something of a zenith of specialisation, centralisation, and conglomeration. In the trade area alone we see that the division of labour has expanded beyond a scale that is any longer 'economic', that is to say, the very benefits that the division of labour have brought to us are now becoming disbenefits, and diseconomies of scale. Species loss, water and power shortages, the impacts of transport, and the loss of food quality and community are just a few examples. Ecovillage as a philosophy can very much be seen as mitigating this state of affairs, and as Liora Adler recently reminded us, ecovillages are the future on this planet. Its perhaps easy to forget this in the hubbub and work of getting our little patch in order. Ecovillage does not disacknowledge the value of communications and other technologies, but simply that sustainability and indeed survival on this planet requires local food, water, energy, social and governance self reliance. And these ideas stand today harshly at odds with the modern globalist agenda. Sometimes the future is less visible in the here and now, and visiting experts from overseas help to open eyes. This was very much the case with the arrival of the Kennedys. Kim Hill interviewed Declan on National radio, and the NZ Herald ran a half page article on 24 November on Ecovillages. This exposure is welcomed, and yet for those that have been pioneering in the field for some years now it is still a case of minimal recognition and acceptance by modern society. In 5 years time Ecovillages will be the thing. In the mean time only the vision, integrity, strength, and courage of founders carries projects into being, and that's the way it goes. Margrit and Declan Kennedy, from Germany, were instrumental in the creation of GEN. 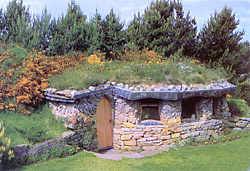 They hail from an ecovillage called Lebensgarten. Declan provided us with a translation of the Lebensgarten brochure which is now online here. I found them to be wonderfully inspiring people and its exciting to see what is happening around the world. They are running a series of talks and workshops throughout NZ between now and January. I spent the day with them in Tauranga, with the morning devoted to the topic of money, and the afternoon on European Eco-settlement design. They have a great set of slides of dozens of European projects, if you get a chance to see them. Time after time these relatively dense and largely urban projects were the result of the sweat of small groups of people who refurbished old buildings with roof top gardens, massive insulation, PV and co-generation plants, greenhouses and a range of other eco-systems. They made the comment, that while many of these projects required great perseverance, practice has shown that as time passes these ecovillage houses become very much in demand, with waiting lists. That to me is a symptom of intelligent design. Margrit has written a book on Inflation and interest free money, and her talk on the subject was fascinating. She asks why it is that money always seems to rule sustainability. She concludes that the compounding interest accruing property of our current money means money makes more money and eco-projects that cant live up to 8% annual returns are just not going to happen... unless, that is, people are plain stubborn. That happens too, but she gave an example of how ill-tied to ecological reality money actually is. If one penny was invested at 4% in the year 0AD, this would by the year 1990 have accumulated to an amount equal to 8,190 balls of gold the weight of the earth. If the interest rate had been 5% this figure would be 2,200 billion earth balls of gold. That makes it abundantly clear why the economy is so unstable. She offered us some extracts from her book online here. Hot on the Kennedys' heals was another visitor, Liora Adler from Mexico. Liora is also a GEN representative, and co founder of an ecovillage in Huehuecoytl, Mexico. Since then a group of ecovillagers set out with a fleet of buses around South America, stopping for months at a time offering theatre, music and environmental education see www.lacaravana.org . Liora visited a number of NZ communities this last week on her way to a GEN meeting at Crystal Waters. Liora is a consensus wiz, and was particularly impressed with the acheivements and progress at Awaawaroa. Awaawaroa Eco-Village has sold its last share, which must be cause to celebrate indeed. So maybe if you need a break from the stresses of EV development, a stint with the mobile ecovillage LaCaravana might be just the thing! A question on my mind lately is how useful is this network to projects? I appreciate the challenge is often finding the time to network, but Id be interested to hear peoples ideas about things that we could do to be more helpful. Recent visitors illustrate for me how unique each countries EV challenges are, and that local networks are best placed to support local projects. One point made was that community skills are both a major crux and major asset. In spite of the fact that 90% or more of community failures are connected with inadequate social tools, conflict resolution, facilitation and decision making skills are most often to be richly found within ecovillages. At Lebensgarten these skills are the source of one of their bigger exports as they offer the skills to other organisations. Lioara reminded me to remind us all of the value of hospitality exchanges. Take a day or two out and go visit another ecovillage. There's lots to learn from each other, studying our successes and failures. Margrit mentioned the value of talking openly about our failures...which is, ahem, something we are usually not too keen on. But nonetheless a source of rich learnings. 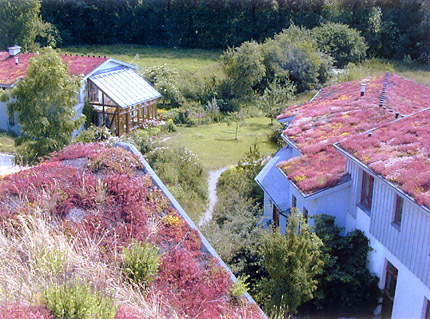 In closing today, the photo below is from Kiel Cohousing in Germany. Its a urban project with 21 houses on 1.2 hectares, and it helps illustrate the thesis that indicates that most sustainable villages since time immemorial have utelised clustered housing. Clustering facilitates sufficient mass and diversity of people within one walkable service zone They've done a nice job, wouldn't you say? Actually their neighbours "have tended to resent the unkempt appearance of grass roofs and compost toilets"! Turf roofs to homes in Kiel-Hassee Okologische Siedlung, Germany. The project also has compost toilets throughout, and a wetland greywater system. You can register to be notified when this page is updated, and/or to have copies of notices placed on the notice board emailed to you. In addition, assistance is offered to groups wishing to have a web presence.